My last three techniques looked tricky, but weren't. The results are spectacular! This technique produces the tie dyed look and is so much fun to experiment with. I spritzed my paper with water and then dropped ink using my brush onto the paper. The color spreads out in fun ways, following the water. I then added the second color and used my brush to smooth out the edges. 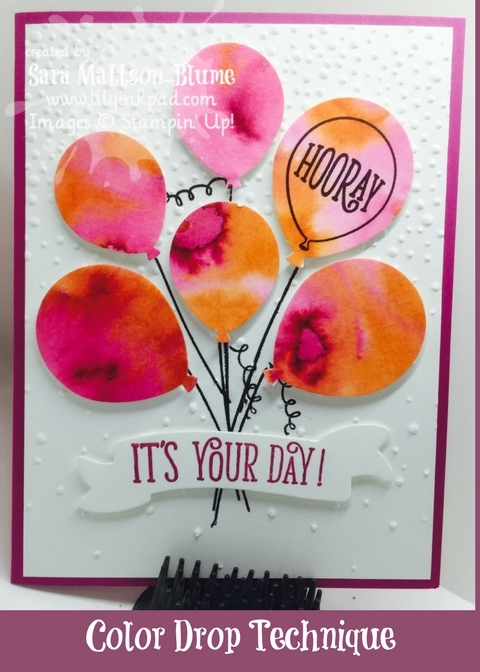 After it dried, I used the Balloon Bouquet Punch to create the balloons. I added them in a bunch using dimensionals. 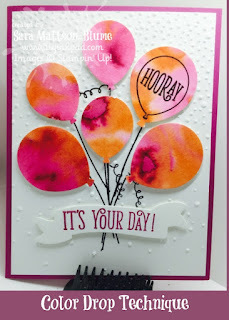 I used a Whisper White background that I had embossed using the Softly Falling Textured Impressions Embossing Folder. The next technique I named Marker, Block, Spritz because that's the order of the steps. 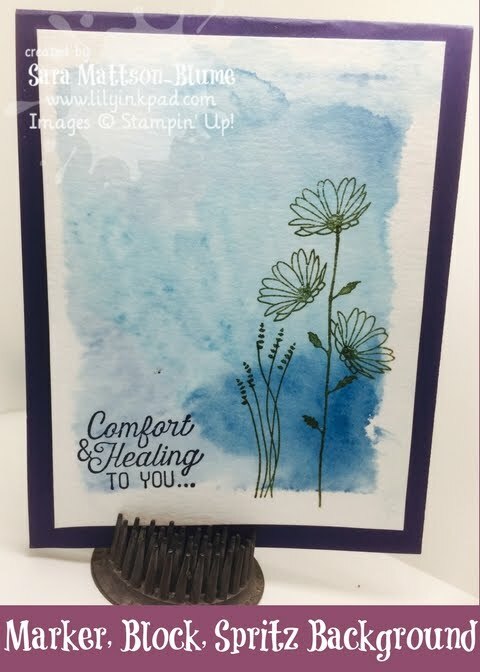 I colored my E block with Soft Sky, Marina Mist, Tempting Turquoise, and Dapper Denim. Next, I spritzed the watercolor paper with water. The more water, the more muddled the design will be. I then pressed the block onto the wet paper and watched the colors blend. After lifting up, they blend even more, and after it dries, it looks a little different. My final step was to stamp my images in Always Artichoke and Night of Navy. The little asters are from the Daisy Delight stamp set. The final card I will reveal during the New In Colors Blog Hop. but basically, I just made a watercolor wash with Fresh Fig and Calypso Coral. I then added salt to make a cool background. I hope you enjoyed these projects as much as I enjoyed sharing them.